There was blood shed on July 8, 2008, but for a good cause. By donating about 30 minutes of their time and a glass of their blood, AQD personnel and their kin did their part in saving lives by ensuring that those in need could avail of this precious fluid. 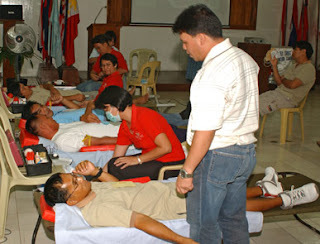 In cooperation with the Philippine National Red Cross (PNRC), the bloodletting activity was held at the Conference Room at AQD's Tigbauan Main Station in Iloilo, Philippines. Dr. Dennise Roy Pasadilla of PNRC gave a pep talk prior to the donation, wherein he explained the procedures and the benefits of blood donation. Among the requirements: the donor – a healthy male or female – must weigh at least 110 lbs (50 kg); must be 18-60 years old (although regular donors can keep giving blood until age 65); and must have a minimum acceptable hemoglobin of 12.5% for females and 13.5% for males as determined by the PNRC's medical technologist. After further screening and blood typing, the donors then proceeded to have their blood taken. In the end, 35 bags of blood were collected from 35 donors, who each shed about a glass (around 230 cc) of their blood. Saving lives and celebrating its 35th anniversary, AQD is committed to strengthening the legacy of responsible aquaculture in Southeast Asia.